To put my own touches on it. Have something no one else and something people enjoy to look at. Not from afar but little details that can only be seen if you get up and close to the bike. 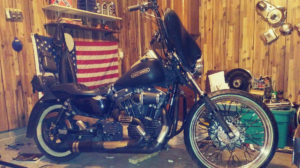 Love of Harley’s, it’s heritage and guns. Wanting to make it something different from the rest. Personalize it as my own and something no one else has. Mass production = everyone has one. Cutting a bullet belt up and using it to trim the floorboards. 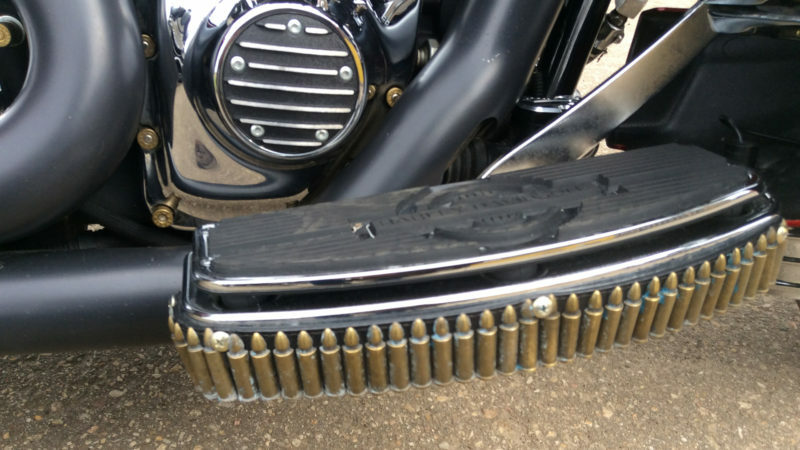 Using bullets to compliment my Tailgunner pipes. 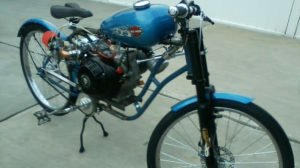 That I was able to use my imagination and creativity and adopt it to my bike. 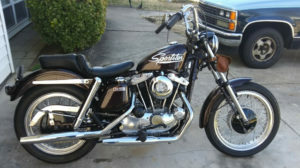 Belt buckles, belts, bullets,hood ornaments, keychains, toys, paint, hydrographics, newer technologies, enabled me to dream. Everyone lives the rotating gatlin gun pipes. They like the fine details of bullet bolt head caps. Engine: HD 103cu.in Screaming Eagle. Power commander V programmer. 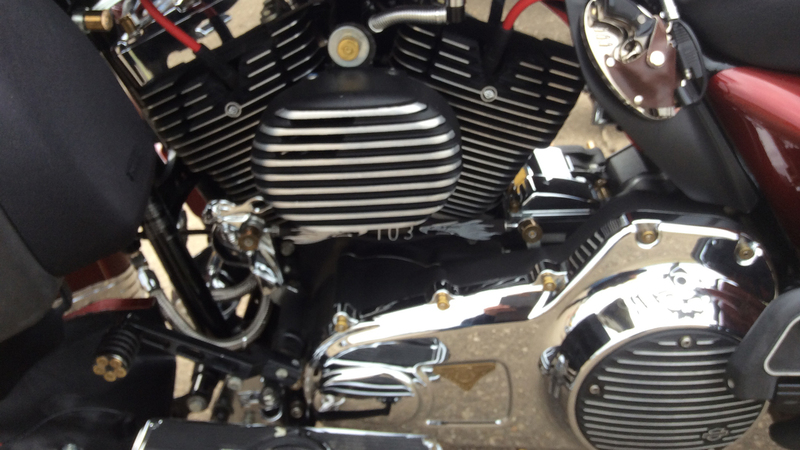 Exhaust: Rotating cannons by Tailgunner Vance and Hines true dual headers. Wheels, tires and brakes: Bridgestone Commander III tires OEM rear wheel and rotor. 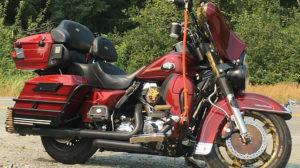 Streetglide front wheel with solid discs. Finish - Paint: Hydro dipped front wheel and inner fairing. Powder coated black highway bar, bag guards, console, trunk support, luggage rack, fork uppers, highway light bracket, headlight ring and red front caliper screen inserts. 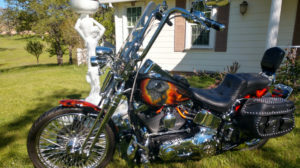 Accessories: LED lights, Windcutter low windshield, integrated mirrors and batwing trim, 12” mini apes, garage door remote front brake master cylinder cover, “Nostolgic” HD grips, floorboards, passenger footrest and highway pegs. Ribbed derby, ignition, air horn and spark plug covers. A-frame oil cooler. Billet ribbed housing & washable oil filter. Rockford Fosgate amp. Cerwin Vega speakers x 4 6” subwoofers x 2 in lowers. Replaced cigarette lighter with USB ports. Added USB ports to LH engine cover. 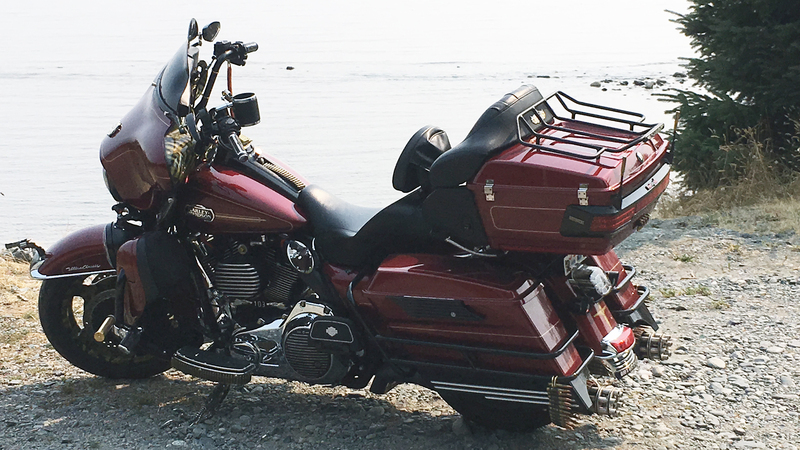 Saddleman gel seat and backrest. 12” mini apes Passenger fold away drink holder Bullet antennas Ribbed look bagnextenders Ribbed look fuel door and ignition switch cover. Ribbed look saddlebag latches. 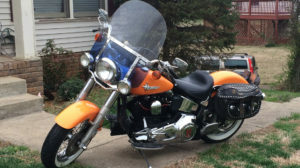 Streetglide tail/signal light assembly with LED brake and signal lights. Rear fender extension with integrated LED brake and turn signals. LED trunk lights with integrated brake light and flasher. LED engine lights. 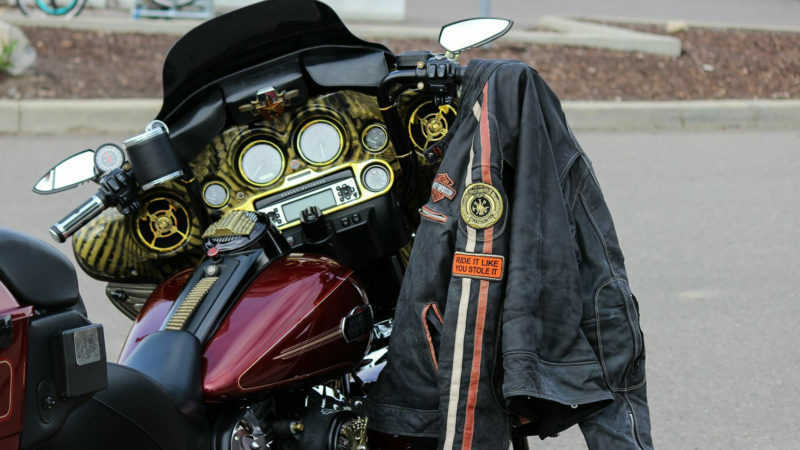 Daymaker “Gold finish”headlight Dual 7” LED fog lights with integrated LED signal lights. LED fender light. 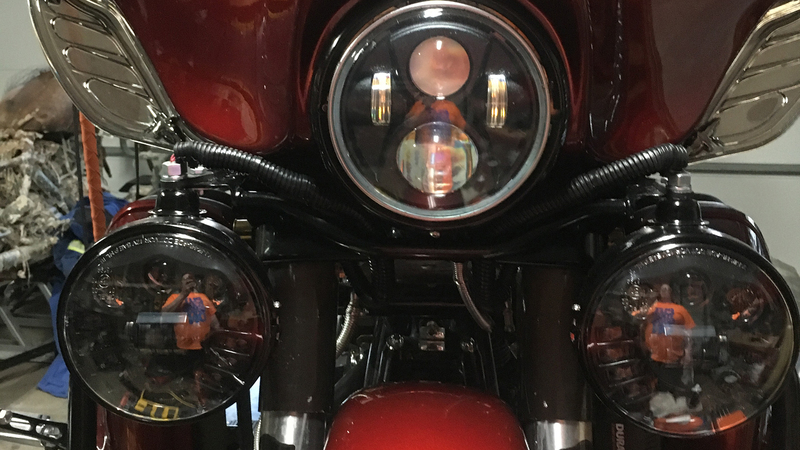 LED guage lights. HD compass gauge. Ribbed levers Custom SE103 shift linkage. 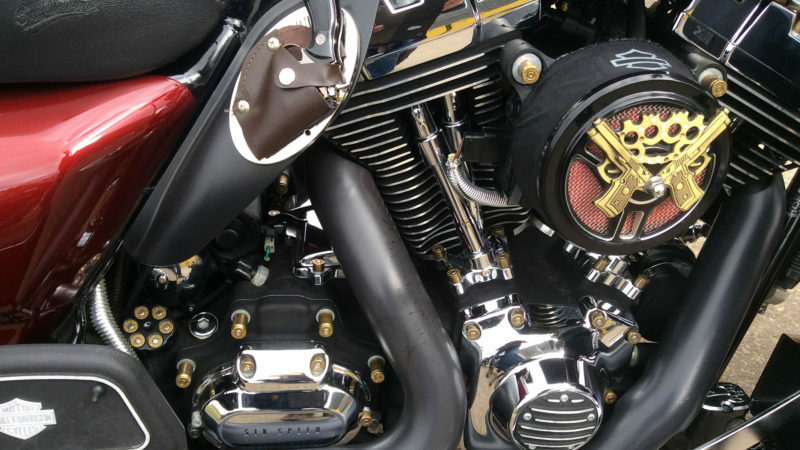 Custom lathed brass bullet highway pegs Bullet oil filler gauge cover. Bullet shifter peg. Bullet bolt covers. Bullet valve stem caps. 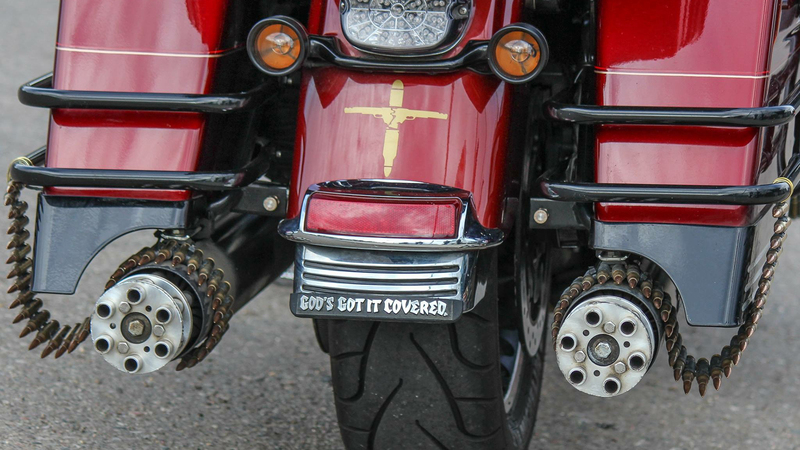 Bullet front axle covers. 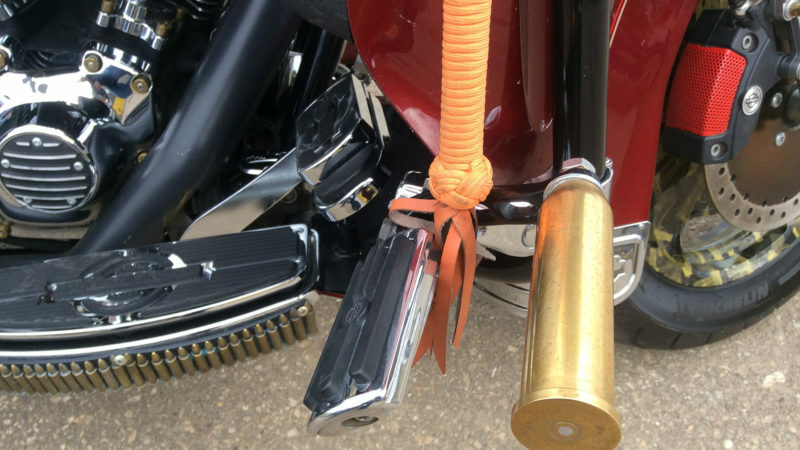 Bullet windshield bolts. Spider-Man helmet holder. Trunk compartment storage adapter. Windshield 3 compartment storage. 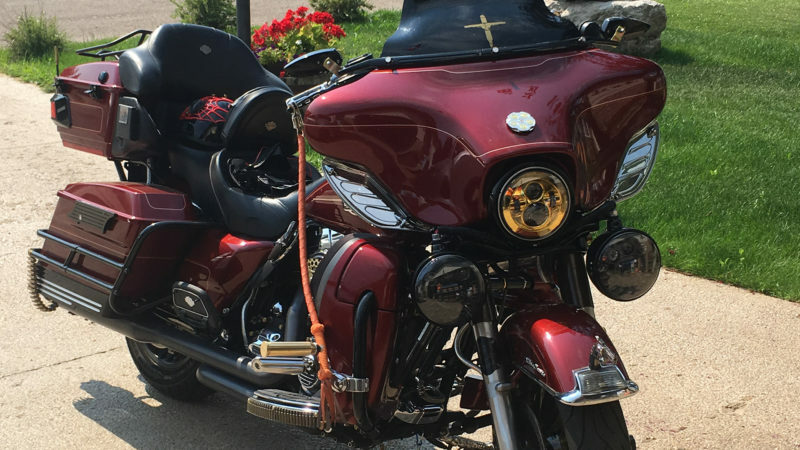 Saddle bag guard and storage Eagle Claw kickstand. Air horn. Get back whip.